Water pipes have a good chance of freezing in the dead of winter, when the temperatures plummet and the outdoors even leave some parts of the indoors feeling a little like the arctic. It’s these icy parts in your home that call for attention. You home is likely to be heated to some degree throughout the winter months. A heated home does not guarantee that the water pipes in your home are safe from freezing and bursting. Certain areas in a home often remain in a chilled state, like in the attic, crawl space or underneath a kitchen sink. When water pipes run through unheated or uninsulated areas, frozen pipes are likely. How do you know if your water pipes are frozen? During subfreezing temps, you may turn on a kitchen or bathroom faucet, only to be faced with a weak and unimpressive trickle of water—instead of the freely flowing streams of water to which you’re accustomed. This unusual incident indicates a common problem—a frozen pipe. Pipes freeze due to the pressure from the frozen ice inside. Water, when frozen, and the strength of its associated pressure will burst pipes made of any material. Whether your plumbing system features metal or plastic pipes, they are no match for the expanding ice and pressure that lead to a pipe rupture. Homeowners find that water pipes commonly burst when the pipes run along exterior walls lacking sufficient insulation. Garages that hold water supply lines also are vulnerable to freezing pipes. 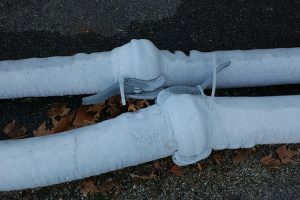 Outdoor water pipes that are exposed to severe conditions are especially susceptible to freezing; these include water sprinkler lines, hose bibs and swimming pool supply lines. Your home features an entire system of water pipes. First, you’ll need to locate the frozen pipe. Examine the pipes located near your water meter. If the meter and adjacent pipes are icy to the touch, they are likely frozen. Frozen pipes near a water meter often cause a complete shutoff of water to the entire home. Or, if water runs in only a part of the home, a pipe running alongside an outside wall or unheated crawl space may signal the problem. Your home’s water pipes will eventually thaw. However, to prevent water from spurting out once the pipes are unfrozen, turn off the main water valve. As a homeowner, take the necessary steps to locate the main water valve before winter hits. You’ll be prepared when the temps dip to subfreezing. Open the hot water faucets in your home. 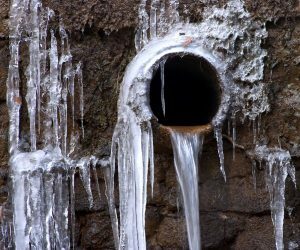 The flow of running water, even a steady trickle, will help to unfreeze areas inside the pipes, as you take steps to thaw the ice. Keep the water flowing continuously until the frozen pipe is fully thawed. You’ll recognize the unfrozen pipe once water streams through it freely. When you’ve located the frozen pipe, apply gentle heat to the pipe to slowly thaw it out. Numerous effective and safe methods will work: an electric heating pad wrapped around the frozen pipe will do wonders to melt the ice; a portable heater situated away from flammable areas will work just as well; a towel soaked in hot water and wrapped around the frozen pipe will help melt and loosen the ice; and, hair dryers have saved many frozen pipes from bursting. When using a heat source, like a hair dryer, work your way from the open faucet, gradually edging your way toward the ice block. This method prevents the steam escaping from the ice and its resulting pressure from bursting the pipe. Experts warn to never utilize an open flame source, like a kerosene heater, blowtorch or propane heater. The rapid heat from these sources will likely cause an explosion within the pipe. Once you have supplied enough heat to melt the icy blocks inside the pipe, the water pressure in the pipes will be restored. If your home has one frozen pipe, you may be faced with additional ones too. Examine all faucets in your home to ensure that water runs freely through each. Certain pipes may be inaccessible. When you find a frozen pipe that is out of your reach, contact a licensed plumber. You may also want to consult a professional if you are unable to locate the frozen pipe. Ruptured pipes are no easy mess to clean up. The resulting water damage from a burst water pipe can wreak massive damage to a home or business and the property inside. Water flooding into your home via a frozen pipe that has burst will seep into the porous materials of your home, from the drywall to the carpeting. Discoloration, permanent structural damage, warping and mold growth will occur within hours. If the water pipes in your property have frozen and burst, contact a water damage restoration professional immediately. 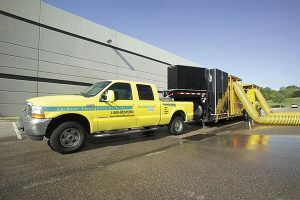 Your safest bet is to place a call to a company that offers 24-hour service, like ServiceMaster by Restoration Contractors. As a home or business owner, gather all contact information for a local water restoration company well in advance of winter and its possible catastrophes. Your preparation will save you time and the headache of dealing with a burst pipe, if or when it occurs. The water damage restoration experts of ServiceMaster by Restoration Contractors handle every aspect of water damage cleanup. Our technicians utilize advanced water extraction methods and equipment to dry out the space thoroughly. Mold remediation services are also part of the restoration package. We will also help home and business owners with their insurance claims. When an emergency strikes, rely on a trusted service provider like ServiceMaster by Restoration Contractors, which faithfully serves the Fort Wayne and Northeastern Indiana communities.